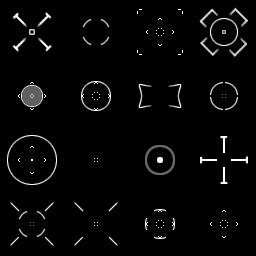 A pack of 64 FPS style crosshairs, most are intended as helpers for weapoin aiming, some are more general case 'icons' ..
- they are 64x64 in size and laid out sprite-sheet style on a 512x512 texture. - don't scale very well, sorry for that. Feedback and action shots more than welcome! Thank you so much for proving public domain resources, they will be put to good use. These crosshairs have a black background - would be much more convenient if the background was transparent. This should do the trick for you, superjoe. Thank you for these. 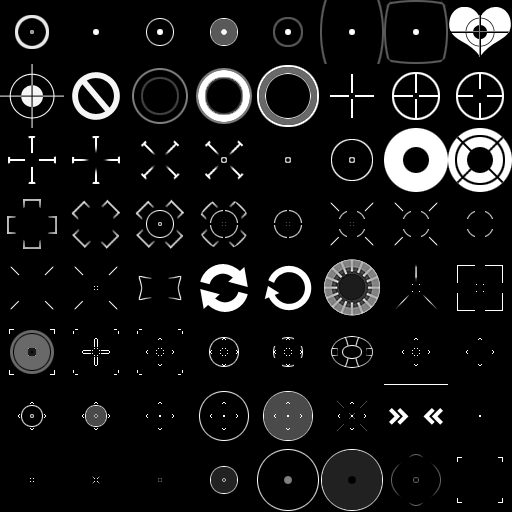 I've converted the png to alpha and split them into separate files using imagemagick. Attribution is fun! It is a constant reminder for me as to how much the community really gives to our project.